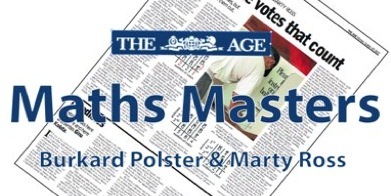 From July 2007 until October 2014 we wrote the Maths Masters column for the education section of Melbourne's AGE newspaper. This column appeared in print until the end of 2008 and then online. Over the years the ever increasing number of articles meant that the following linked list of titles was becoming less and less useful. Now that the column has ended and we don't have to constantly worry about next week's article, we'll reassess how to best make all this material accessible to our readers. While we are working on this project the maths masters archive will stay offline. Drop us a line if you are looking for anything in particular or if you wish to receive e-mail alerts for new articles, and other QedCat news.